Like many Southerners, I'm a big fan of Louisiana native and fashion designer, Billy Reid. I've been hoping to visit his flagship store in Florence, Alabama sometime this year. But after an impromptu visit to Charleston, South Carolina this weekend, I was more than happy to stumble upon a Billy Reid store there, just a block from my hotel. Store Director, Shelby Hightower graciously showed me around inside. It became immediately apparent that bowties are one of Reid's signature styles and are certainly popular in Charleston. In fact, I saw them worn by men every time I walked outside my hotel. I absolutely love how Southern and classy the town of Charleston looks and feels. And the fashion plays an integral role. Inside every Billy Reid store, (there are four located throughout the South and one in NYC) you'll find clothes for both men and women. And for the men this includes hats, footwear, neckwear, luggage and a bevy of fashion accessories. Shelby describes the Billy Reid brand as "Southern refined luxury that's heirloom quality. The items are made to last." When I asked Shelby her biggest style tip for men this year, she responded, "They need to learn how to layer with a dress shirt, tie, sweater and blazer." She believes the Southern man should own both a lightweight blazer and a heavyweight wool blazer. She offered one more valuable tidbit, "Contrasting colors and patterns can go together. Don't get stuck in traditional looks." Inside every Billy Reid store, the decor is classic Southern meets hip man cave. Shelby shares, "We want people to feel like they're walking into Billy's closet." I like the social table which has some bourbon on hand. Depending on the season, you'll also find sweet tea and lemonade or warm apple cider. Hospitality is big in the South and it's exemplified here in Charleston. Thank you Shelby for your wonderful tour and help around the store this weekend. I had a blast -(and bought an adorable babydoll dress on sale, I couldn't help it.) For those that live in Atlanta or D.C., you'll be happy to know that a Billy Reid store is arriving in your city this year. 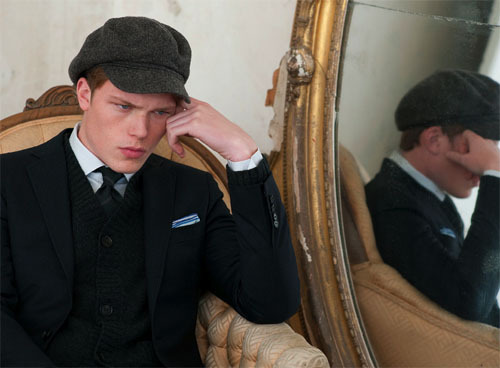 I savor the idea of a Billy Reid clothed man...more please!